Understanding color theory will make your design projects much easier. Simply put, the color wheel provides a visual representation of which colors blend nicely together. It removes all the guesswork, essentially. Most models are comprised of 12 main divisions. However, in theory, the color wheel could be expanded to include an infinite number of shades. The color wheel is paramount when understanding color theory. If you’re unsure of where to start when it comes to decorating a colorful interior, one of these 12 is often a good jumping off point. Pick one and it will help you narrow down your selections until you settle on the exact shade that you love. Primary and secondary colors instantly brighten any space. Once you’ve selected a basic color, it’s easy to create many different versions within the same family. All you need to do is combine that color with a neutral in order to make it lighter or darker. In interior design parlance, this is known as tint, shade, and tone. Tint: The act of lighting a color by adding white to it. Shade: The act of darkening a color by adding black. Tone: Slightly darkening a color by adding gray. Create tints and shades by adding neutrals to your base color. You may have heard colors described as having a temperature. A dining room may be decked out in warm tones while your friend may have chosen a cool color to finish off her bedroom. These temperatures also describe where the color falls on the color wheel. Reds, oranges, and yellows are often described as warm colors. They are typically more vibrant and seem to bring a sense of liveliness and intimacy to a space. In contrast, blues purples, and most greens are the cool colors. They can be used to calm down a room and bring a relaxed feel. When choosing color temperature for a space, you should also consider the size. Using a warm color in a tight room could make things feel a little claustrophobic. However, using cool colors in a spacious room could leave things feeling stark. Use warm colors to encourage lively conversation. When it comes to color schemes, complimentary is the simplest. It uses two colors that sit opposite each other on the color wheel. Typically one color acts as the dominant shade and the other as an accent. This means combinations like red and green, blue and orange, or yellow and purple. This color combo is extremely high contrast, which means that it’s best used in small doses and when you want to draw attention to a particular design element. You could use it to make your powder room pop or to bring extra vibrancy to your home office. If you choose a complimentary color scheme, you really need to embrace neutrals. They will provide a place for your eye to rest and keep you from becoming overwhelmed in the room. Use neutrals to balance out the high contrast of a complimentary scheme. If you like the idea of a complimentary color scheme, but are afraid it may be a little too bold for your tastes, split complimentary is a safer choice. To make this color scheme, you would first choose your base shade. Then, instead of choosing the color directly opposite of your base, you chose the two shades on either side of the opposite color. Those two shades will provide a much needed sense of balance to the room. You’ll still get the visual impact of bold color, but you’ll be able to incorporate more of it instead of relying heavily on neutrals to calm the space. Split-complimentary works best when you use your base color as the dominant. However, instead of choosing a saturated shade, try to focus on a color that is more muted. Then, go bold with your other two shades in the room’s accent pieces. Split-Complimentary color schemes are often calmer versions of their complimentary counterparts. The analogous color scheme refers to using three colors in a row on the color wheel. Typically, two colors will be either primary colors with the third shade being a mix of the two and a secondary color. For example, you could choose red, orange, and yellow or red, purple, and blue. The key to using this color scheme successfully is proportion. The 60-30-10 Rule comes into play here. You’ll want to choose one color to be the dominant shade, one to support the dominant, and the third, most vibrant color as an accent. Interestingly, you can also create a similar color scheme using neutrals. It’s typically referred to as a monochromatic color scheme. Simply choose black, white, and gray in lieu of brighter shades. Stay in one section of the color wheel to create a relaxing look. Triadic color schemes, sometimes also referred to as a triad, refers to using three colors with equal space between them on the color wheel. The three primary colors (red, blue, and yellow) are a perfect example, as are the three secondary colors. This type of color arrangement is often extremely bold. Since the colors are in such high contrast and pure hues are often used, you’ll most often see this scheme in children’s bedrooms or playroom areas. When using colors that are this lively, it’s always important to consider the spaces that are nearby. You wouldn’t want to put two different triadic color schemes next to each other. That would be too busy. Instead, make sure that the rooms next to your triadic space are calmer and mostly neutral. The boldness of a triadic scheme makes it the perfect choice for a kid’s room. After the triadic scheme, things get a little more complicated. We’re moving on to balancing four colors in the space. The tetradic scheme, also sometimes referred to as a rectangle scheme because of the shape it makes on the color wheel, focuses on using two distinct pairs of complimentary colors. In this scheme, color temperature plays a very important role. 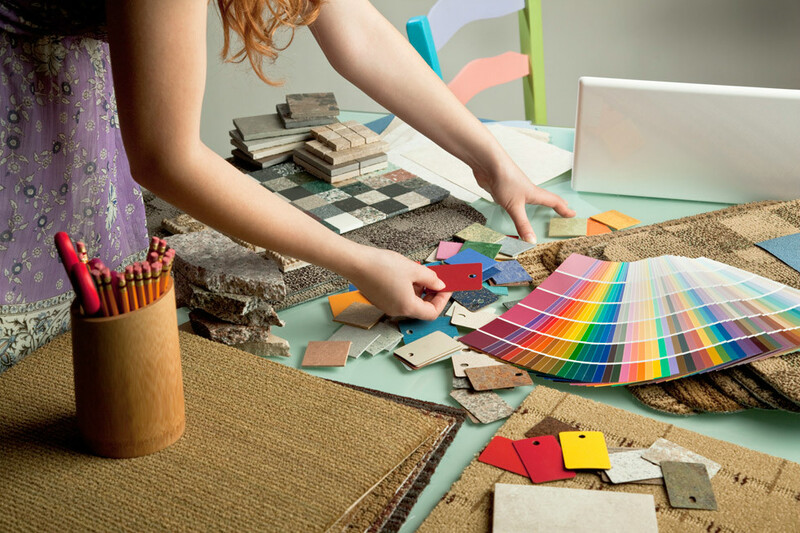 Try to make sure that you choose two warm colors and two cool colors to fill the space rather than an odd number. Using an even amount of both will help bring balance to the space. It’s also important to vary how we view the colors. Look for patterns that fall within your color scheme and don’t hesitate to mix them among your solid pieces. If you use all solids, the room will seem overly saturated, but too many patterns will clash, so focus on choosing one or two to help break up the space. Balancing warm and cool colors is essential in a rectangular color scheme. The square color scheme is very similar to rectangular in both number and name. It uses four shades, but instead of focusing on opposing pairs, the colors are evenly spaced throughout the color wheel. No matter which colors you choose, this scheme will be comprised of one primary, one secondary and two tertiary colors. Vary the intensity of the four colors by making two shades more neutral and two a little bolder. Again, similarly to the tetradic scheme, you’ll want to pay attention to achieving an equal number of warm and cool colors. But, rather than giving equal attention to both color pairs, you should pick one shade to dominate the space and use the other three as accents. Mix patterns and solids to add visual interest. Sometimes interior design lingo can seem like its own language. No one could blame you if talking about furniture, layouts, and décor, makes your head spin. So if this information hasn’t made your project any easier, please call and schedule an appointment with one of our designers.